Miramol is a gender ambiguous doll, initially manufactured as a female but not identified as a she. It was made in Korea and imported to the U.S. for commercial distribution targeted towards the age group of three to eleven. Miramol was the original prototype of the ambitious 'Oriental Doll Series' designed in 1987. However before mass production, the on-going postponed project was abandoned by Atoy Inc. in 1992 (Atoy Inc. is a prestigious toy company in the market, best known for manufacturing dolls for children). Company executives were aware of the 4.29 L.A. Riots and concerned about using a Korean prototype as the representative image of their new ambitious series. Also, as the tween market started to become the new goldmine, market researchers announced that dolls should be more mature, fashionable, and realistic. 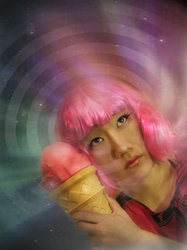 Therefore, 'ugly (which the company executives started to call it after the decision of re-designing the project)' Miramol was discarded with other items such as a pink nylon wig, an ice cream cone, and a video kit. Current Location of Miramol: Unidentified. Current state of mind: Confused. ​A playful contraption illustrating the connection between reality and the subconscious. With a particular sense of humor and an awareness of the absurd, I introduce an imaginative space and character that embraces the tension between the literal and the mundane, reality and dream, past and future, time and place. A video about Miramol’s hypnotic journey to the subconscious involving narcissism and constant fascination towards the unknown, a site for self-reflection. with a segment from the video "Marvelous Miramol"
Sspectra - With it's colorful aurora accompanied by a primitive costume, Sspectra leads Miramol and the audience into the state of calmness and illumination. Using various light sources, prop instruments, live music was produced during the performance. ​Nothing to see here except for this flying dove!